Transitioning from one season to the next is always a pleasant and renewing experience for me. Each year I seem to add to or totally change my decor for each season. As each new season begins to approach I wait for some spark of inspiration to hit before I change up my decor. You’ll never believe where or how the spark happened for this season. Sometimes it will be a beautiful arrangement of flowers inspiring me with their array of colors . . . Sometimes it will be during my morning runs and observing an object in nature . . .
Other times it may be from a magazine, a picture, or a memory. But this year it came as I was driving down the street one evening and noticed a sidewalk sale happening at one of my favorite local boutiques in town (Amy’s Boutique). Even driving, well I was the passenger, I spotted this colorful object in a basket. To my great surprise it was a beautiful woven rug, full of vibrant colors. As I laid it out my husband gave me a look, a big questioning look, (more like where in the world would that match in our home). But you see, I had a vision, a plan, a spark of inspiration. I knew exactly where this colorful handmade rug was going . . . Right on my table as my summer-to-fall tablecloth. Sometimes in order to be truly inspirational you need to think outside the box. This piece was the only new item I added to my table decor this season. I pulled the rest from my collection. 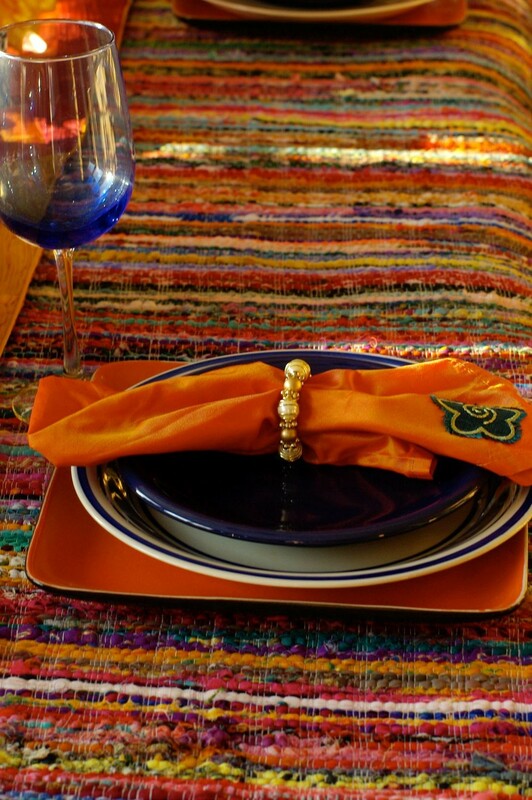 Adding a layer with a table runner I received as a gift from India, some orange square dinner plate as placemats, white and royal blue dinner plates, followed by royal salad plates. 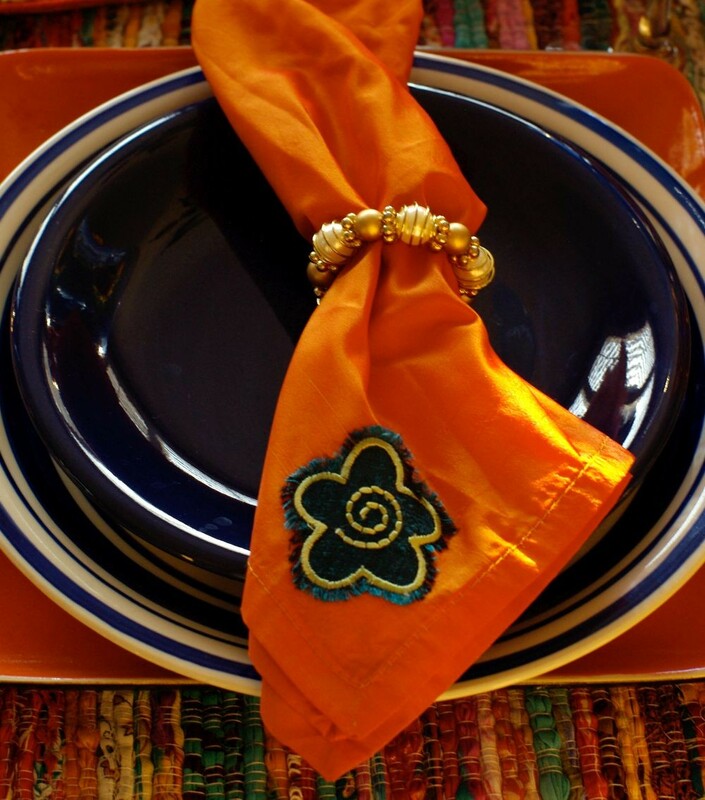 Topping it off with orange silk embroidered napkins inside some gold napkin rings and royal blue goblets. 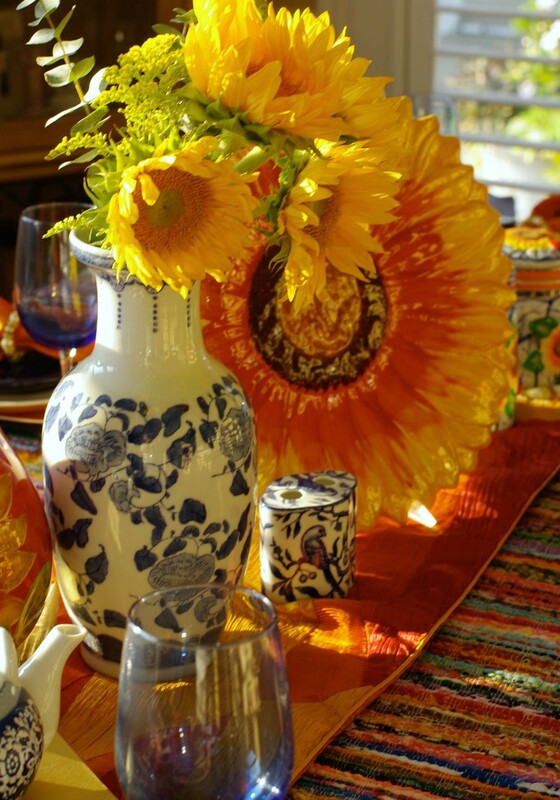 For the table scape center pieces, I also drew from my collection beginning with the center vase and filling it with fresh sunflowers . 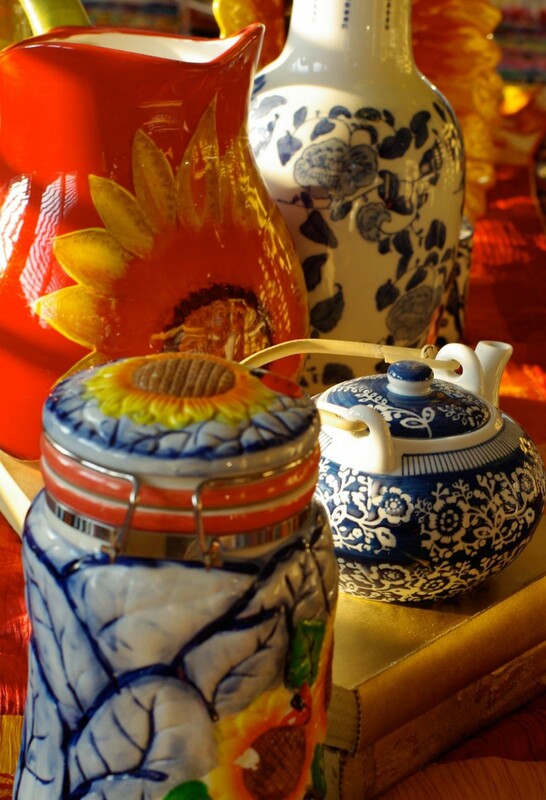 . .
And then adding some of my ceramic collections . 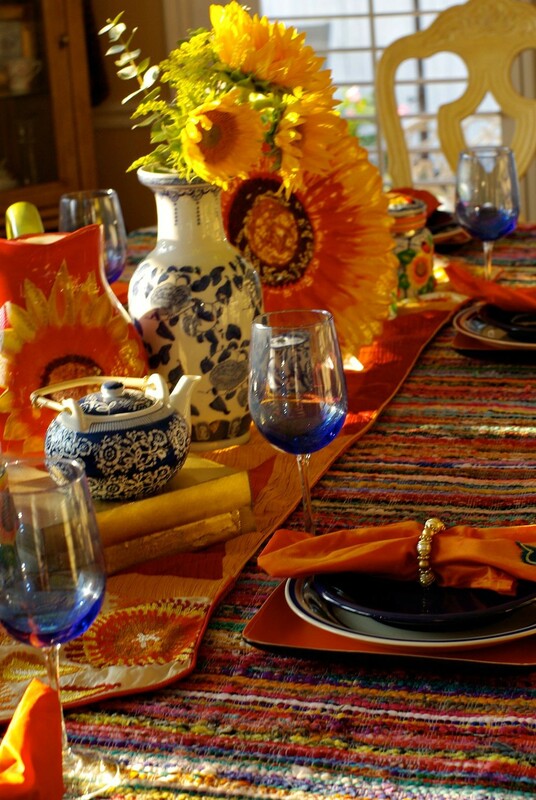 . .
Mixing and matching old and new always seems to bring a table together. I think I’m going to quite enjoy this colorful transition. Now on to the next room, and who knows it may just lead to my outfit choices as well. As always my friends, thanks for dropping by. Have a most colorful and wonderful day. Also with Jennifer and Heather for their monthly lifestyle inspiration linkup. Sorry about the grey already, I do have a bunch of grey outfits if you want to borrow some. I did put together an outfit with this color scheme and I’m really liking it. Oh Trina, this is so charming!! Love the rig runner idea!! So smart! Absolutely gorgeous. It’s like golden summer/autumn on the table. I see it and think of book stores and eating pumpkin pie. However, if I were in reality at your home, I’m afraid I would reduced to staring at this beautiful layout too afraid of disturbing it with any sort of dining activity. Great idea about the rug. If this brought to mind book stores and pumpkin pie eating, then I love it even more so. Those being two of my favorite past times. However, I would never ever want to have my home give off a “touch me not” feeling, only one of happiness and inviting atmosphere. I can promise it would be absolutely fine to be disturbed, it actually gets that way daily. I just have some fun putting it back together. In fact, I believe my son and husband enjoy the disturbing part. Oh, wait, what am I thinking, I’m making a call to hubby right now to bring home a pumpkin pie, thank you cute girl for the idea. Would that entice you to join me? Wonderful pictures, light and fascinating colors. 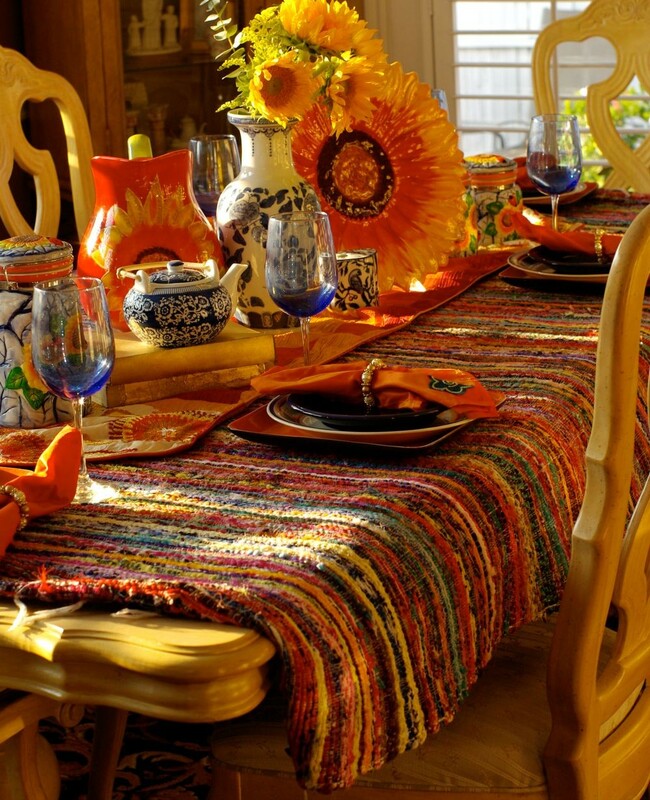 You really are a great artist decorating tables, and parties. The carpet is a real cute, of course, she inspire you. Holy cow! You have wonderful taste. The colors and shapes here are gorgeous. 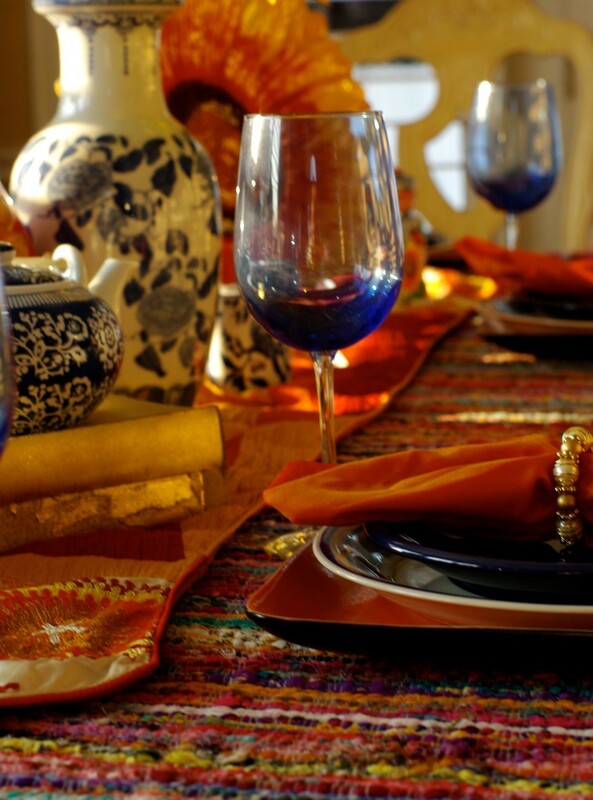 It’s obvious you have abundant talent at styling décor. Like you, I enjoy using the change of season as an excuse to try something new. That is the brilliant thing about creativity. You can be inspired anywhere by anything. Such a great eclectic mix. i just want to sit at that table and sip and chat and nibble for hours!!! Lovely table. You always know how to transform a room. Such joyful colours. I would wonder though whether the glasses would not wobble on the thicker rug…. You see, I am too practicle to think outside the box. Love the combo of orange and blue together. Your table looks lovely. So Pretty. Love the garage sale jars! #STYLEFOCUS……..I better do that before I forget!! Trina, love the rug! I have a friend that puts rugs like this on her table all the time. This one is just perfect for Fall. 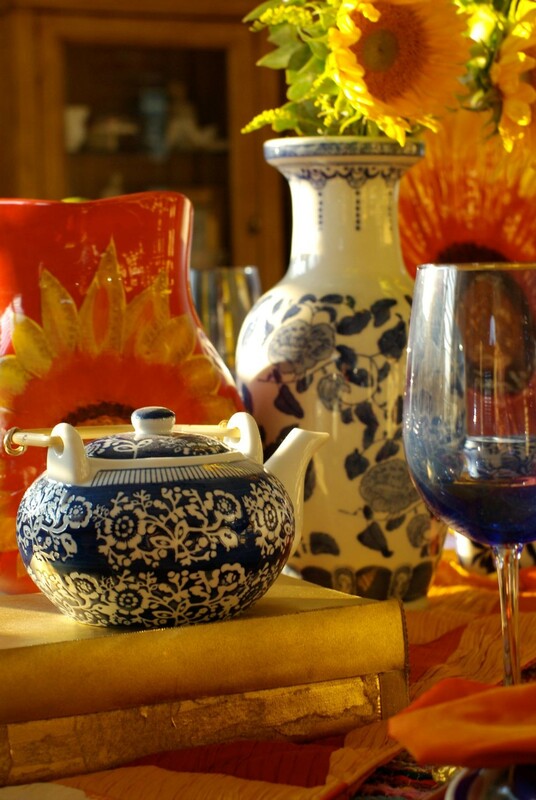 I love a mixture of blue and yellow and you have so many pretty pieces! Thanks for sharing with SYC. Hi Trina, featuring your sunny tablescape at SYC this week my friend.